My name is Ashwin Roy. I’m hail from a sleepy punjabi town of Abohar near the Pakistan border. Completed my engineering from Guru Teg Bahadur College of Engineering and Technology, Malout in 2006, after which I moved to Bangalore for 3 years to work in IT Sales. I had to quit my Bangalore job, to move closer to home once I got married. In 2010, I decided to settle down in Chandigarh, and joined the multinational computer technology firm- Dell in their IT Sales team. When Dell had to shut down their office 3 years later, I sought various odd jobs, before deciding to join Uber as a partner. The decision to join Uber was easy- being my own boss, setting my own targets, and having no one to berate me if I fail to meet them. It was convincing my family, which was the hard task. It took a lot of convincing for them to realize that I was making as much money, if not more, without anyone constantly breathing down my neck. I decided how much I earn, I decided when I work. People sit up and take notice of the Partner who responds to their queries in English when they are in my car- Bangalore habits are hard to shake off. Although many people feel like I am settling for less, being an Uber partner, when I could easily get a job in IT Sales. What they do not know is I’m getting more than I bargained for- money, choice of timings, self-respect and integrity. One day I got a trip from the airport for a rider who was coming from Chennai. To say that he was facing a language problem is an understatement. He was very happy to be connected with me, to say the least. We travelled all the way to his destination happily chatting away, reminiscing about the Bangalore weather, exchanging numbers at the end of what I would call the most memorable trip I have had since I joined Uber. He still calls me every time he is in town. 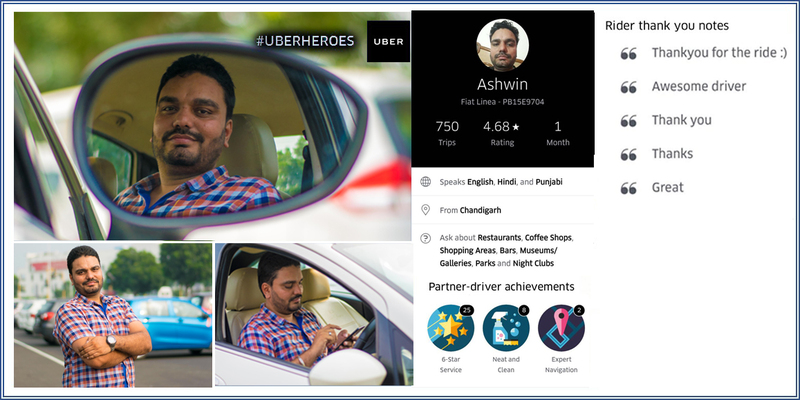 We salute Mr Ashwin Roy for being an inspiring Uber partner. Watch out for more such amazing stories soon!